The formula for alien skin. 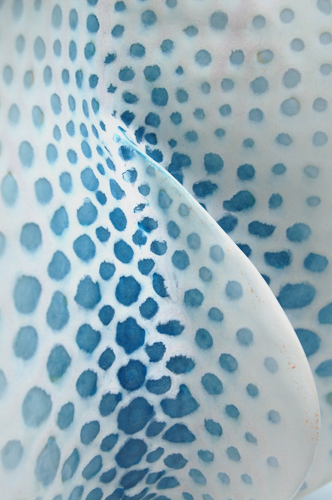 Blue and chartreuse underglazes were applied to the porcelain greenware in a gradation from light to dark. Most of the chartreuse burned out, but what didn’t made the blue a little warmer. After bisque, I applied clear glaze and waxed the dots. After the wax dried, I dipped the entire piece in spodumene glaze. The spodumene blushed pink and orange in places. This entry was posted on March 5, 2008 at 2:03 am and is filed under clay, process, Uncategorized. You can follow any responses to this entry through the RSS 2.0 feed. You can leave a response, or trackback from your own site.